Law enforcement personnel are needed at all levels of government. Federal agencies enforce federal law; state agencies enforce state and federal laws; and local agencies enforce federal, state and local laws. While police officers go by different names -- officer, investigator, agent, etc. -- depending on where they work, they protect the public by investigating crimes and apprehending criminals. The federal government’s principal law enforcement agency is the Federal Bureau of Investigation. Other federal law enforcement agencies include the Drug Enforcement Administration; Bureau of Alcohol, Tobacco, Firearms, and Explosives; Bureau of Diplomatic Security (part of the State Department); Border Patrol; Federal Air Marshals; and Secret Service. Other agencies, such as the Postal Service and Forest Service, employ law enforcement personnel, but their primary missions are not law enforcement. State police agencies operate within the boundaries of their states. Like in the federal government, state agencies perform non-law enforcement duties may also employ sworn officers. State universities have police departments that have jurisdiction over the campus and assist city police departments in cases and incidents around the campus. Local police officers are employed by cities, counties, school districts and community colleges. An average citizen typically comes into contact with police officers during routine traffic stops, so local police officers are what most people think of when they hear the term police officer. A career as a police officer is extremely dangerous, but it can be very rewarding. Officers make their jurisdictions safer every day. By simply making their presence known, police officers can prevent many crimes. When crimes do occur, police officers are the first responders who assess the situation, mitigate any remaining danger, secure evidence and assist victims and witnesses. In many law enforcement agencies, there are different rules governing how law enforcement personnel are hired as opposed to those who are not. In most states, civil service regulations dictate certain parameters that agencies must work within during the hiring process. In addition to normal hiring procedures, candidates must go through written and physical tests. The written tests may measure a variety of things including a candidate’s aptitude for police work, critical thinking skills, personality traits, and psychological stability. Physical tests measure candidates’ sensory perception, strength, and agility. Failure on either type of test means elimination from the hiring process. Background checks, drug tests, and lie detector tests are also likely to be part of the hiring process. There is no standard education requirement across law enforcement agencies. Some require only a high school degree, others require a bachelor’s degree, and other agencies fall somewhere between those two extremes. A bachelor’s degree is required to be a federal police officer. Advanced degrees are not necessary for entry-level police officer positions. Experience is not necessary to become a police officer. The hiring agency will teach new hires everything they need to know. Military experience looks good on an application as does experience in private security, private investigation, and auditing. Bilingual skills are also a plus because quick and clear communication can make the difference between life and death in emergency situations. Police officers should be in good physical condition. A habit of regular exercise and experience in competitive sports are helpful both in the training process and once on the job. If you plan on eating a lot of donuts, you’ll have to hit the gym harder than your colleagues. Everyone likes donuts, not just cops. Once new officers are hired, their employers send them through an extensive training program. Larger police departments conduct these training in-house, but most departments send their new recruits to state or regional training programs. The training programs combine classroom instruction with practical application. These programs typically last several months. The curriculum covers a wide variety of topics including law, civil rights, investigation techniques, traffic control, emergency response, self-defense, first aid, and firearms. New officers should come out of the program with knowledge and skills they can apply immediately on the job. Their departments will likely have them paired with veteran officers until they are ready to perform their duties on their own. A police officer’s duties vary by the type of law enforcement agency. Other than FBI agents, federal police officers stick to their niche. For example, federal air marshals stick to preventing crimes aboard commercial flights. State police officers assist federal and local law enforcement in executing their duties. There are also specialized law enforcement groups like the Texas Rangers that investigate particular types of crime. Do not underestimate the proportion of time writing reports will take. Officers at all levels must report their activities to their superiors, fellow officers, and the public. In many cases, these reports become key pieces of evidence for prosecutors. A common misconception about police officers is that they frequently use their guns. On television, this may be the case, but in real life officer rarely draw their sidearms, and most officers fire their weapons only a few times over their careers. To the greatest extent possible, police officers use words to diffuse tense situations. This fact is underscored by how police departments account for their supplies. Police departments keep an inventory of bullets not by the box but by the bullet. When officers write reports about incidents where they discharge their weapons, they must account for each shot. Crime scene investigators and evidence technicians can tell where the bullets went, what they hit and the damage they caused, but only the officer who fired them knows why they did. According to data from the US Bureau of Labor Statistics, police officers earned a median wage of $51,410 in 2008. The median wage was $46,620 for federal police officers, $57,270 for state police officers, and $51,020 for local police officers. A significant benefit to a career in law enforcement is overtime pay. 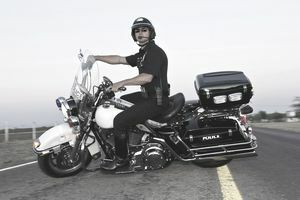 Police officers have frequent opportunities to earn overtime. Some departments offer shift differential pay for officers who routinely work overnight and weekend shifts. If you do not mind working long or odd hours, you can make a lot of extra money doing the same job you do during normal hours. Is a Career in a Police Department Right for You? What It Is Like to Be a Federal Air Marshal?